Martha purchased her Fifth Avenue pied-à-terre in the early 1990s as a city dwelling for those nights when she needed to be closer to her business. The one-bedroom flat is small in comparison to her larger homes in upstate New York, and Skylands in Maine. The apartment is located in an early 20th Century building and features 15-foot-high ceilings and a beautiful view of Central Park from the living room. The apartment is decorated in a minimalist, 1940s modernist style with elements of Art Deco and an eclectic mix of international accessories, like a French Cuban pedestal dining table and 1940s tubular metal chairs. Sleek furniture, tall floor lamps, marble floors and built-in work spaces create a tight and well-considered space, maximizing storage and maintaining an airy feeling in tight quarters. 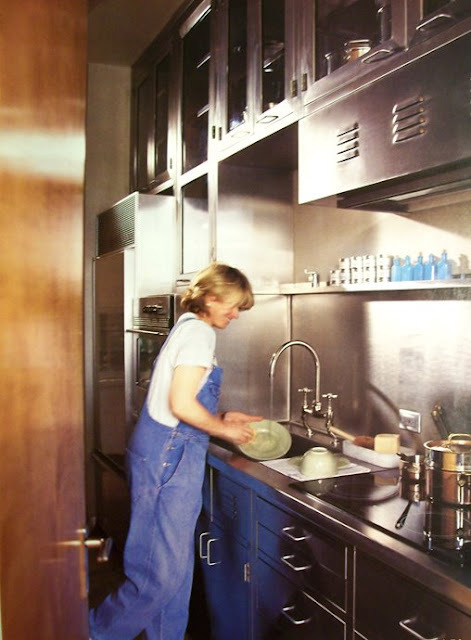 The kitchen was refitted by a New York based company called Duralab, which makes metal laboratory furniture. The cabinets stretch from floor to the ceiling and are made of a metal ply of nickel, steel and lead with baked-on epoxy paint, making them resistant to corrosion and very easy to clean. The base metal is ‘ni-tern’ grade, which is used for automobile gas tanks, making them extremely strong and durable. The cabinets can hold 200 pounds per square foot - ideal for heavy, compact storage. The finished cabinets in what Martha calls her “galley alley” shimmer in daylight, radiating a soft, pewter-like glow, proving that functionality doesn’t have to mean compromising looks. Stainless steel appliances and restoration glass fronts on all the upper cabinets complete the look and create a surface that is easy to clean and maintain. 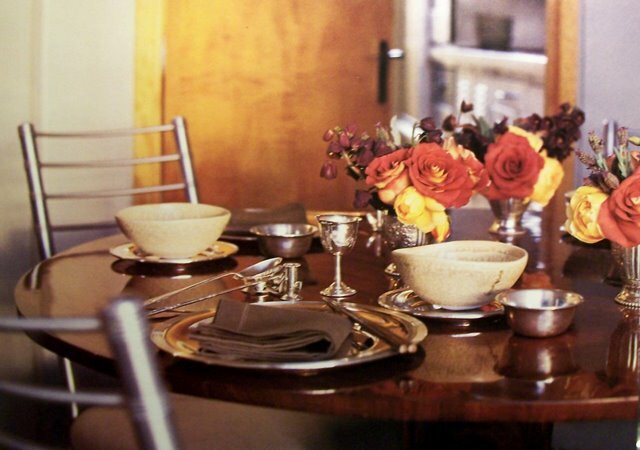 A French Cuban pedestal dining table is set with silver. Note the tubular metal chairs, circa 1940. 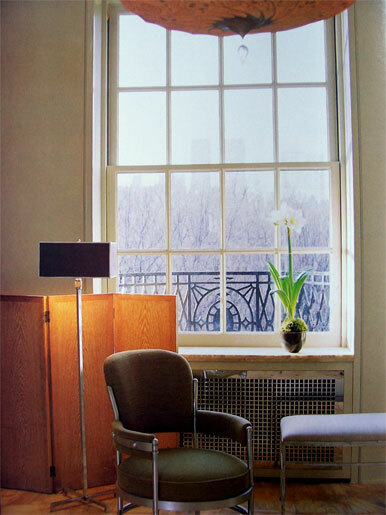 The walls of Martha’s apartment are finished in Swedish putty, a smooth stone-like substance that plays nicely against the furnishings, including a 1940s limed oak screen, a nickel-plated radiator grill, a Warren McArthur armchair and a hand-painted silk and crystal bead light fixture – a reproduction of one that Mario Fortuny designed in his palazzo in Venice. Martha’s favourite winter flower, the amaryllis, echoes the skyscrapers in the view beyond. Martha is known to spend occasional evenings and weekends here but also lends the apartment to family and friends. Thanks for the new photos of the apt., Andrew. 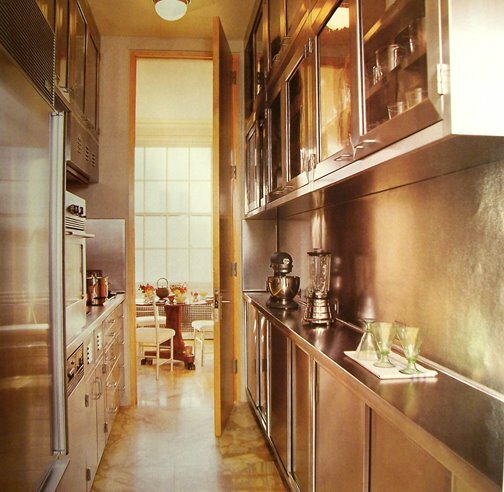 Wow, that galley kitchen is sure narrow!